Size of this preview: 471 × 600 pixels. Other resolutions: 188 × 240 pixels | 785 × 1,000 pixels. Coastal cliff, 1 m. SSW of Upper Borth. Harp Rock'. 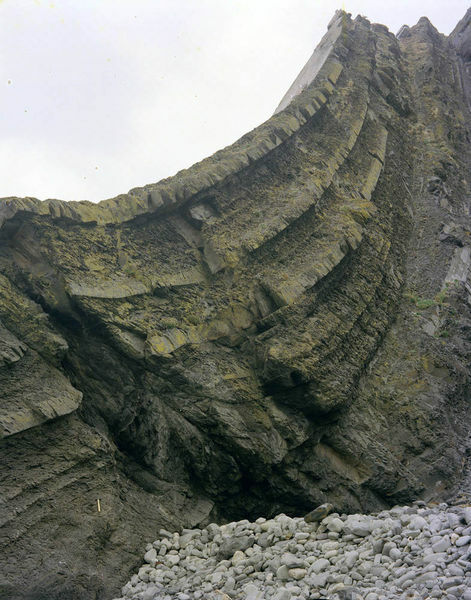 The base of Aberystwyth Grits is taken here at the bottom of the lowest of the three prominent turbidites. current 11:49, 6 June 2014 785 × 1,000 (193 KB) Dbk (Talk | contribs) Coastal cliff, 1 m. SSW of Upper Borth. Harp Rock'. The base of Aberystwyth Grits is taken here at the bottom of the lowest of the three prominent turbidites. This page was last modified on 6 June 2014, at 11:49.